Marchionne collected about $12 million in compensation last year, midway through what the CEO has billed as his final five-year plan for the company. DETROIT -- Fiat Chrysler Automobiles has received subpoenas from U.S. federal and state authorities, including the Securities and Exchange Commission, related to alleged excess diesel emissions by some of its vehicles, the automaker revealed in a filing with the SEC on Tuesday. On the diesel emissions issue, FCA said it has "received various inquiries, subpoenas and requests for information from a number of governmental authorities, including the U.S. Department of Justice, the SEC and several states’ attorneys general. We are investigating these matters and we intend to cooperate with all valid governmental requests," FCA said in its annual report. Earlier this month, a person briefed on the matter said the Justice Department has been involved in the matter for more than six months after getting a referral from the Environmental Protection Agency in July. Involvement by the SEC and state attorneys general has not been previously disclosed. FCA said Jan. 12 that the Justice Department was investigating the matter. The same day, FCA CEO Sergio Marchionne rejected the allegations, saying there was no wrongdoing and the company never attempted to create software to cheat emissions rules by detecting when the vehicle was in test mode. FCA in its annual report said it is not able to predict the outcome of the investigations, but disclosed that "the resolution of these matters could have a material adverse effect on our financial position, results of operations or cash flows and may adversely affect our reputation with consumers, which may negatively impact demand for our vehicles." In January, the EPA said the maximum possible fine against FCA could be $4.6 billion. FCA also is facing scrutiny of its emissions compliance from European regulators. The French government said earlier this month that its Consumer Protection Agency had asked a prosecutor to investigate FCA's diesel vehicles. FCA in its annual report said government and regulatory scrutiny "is expected to remain high." The focus FCA top management must pay to regulatory intervention "may divert attention from other key aspects of our business plan" and may require more recalls of vehicles. Last July, FCA confirmed that the SEC and the Justice Department is investigating its U.S. vehicle sales reporting. Soon after that confirmation, FCA revised more than five years of monthly U.S. vehicle sales figures to reflect a new reporting method. 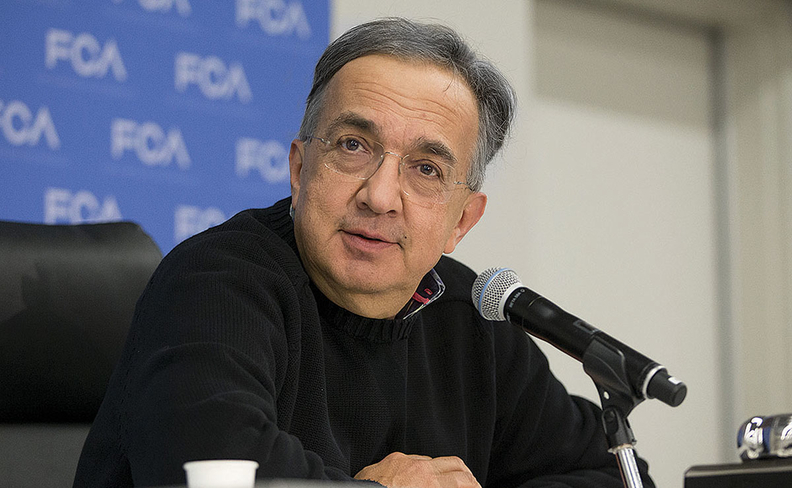 Separately within the filing, Marchionne collected about $12 million in total compensation last year, midway through what the CEO has billed as his final five-year plan for the company. Marchionne received a salary of about $4 million and a bonus worth $7 million, according to the filing. He also received non-cash benefits, such as insurance premiums and tax services, worth about $1 million. The total pay package compares with about $11.1 million in 2015. The CEO has been revamping Fiat Chrysler’s lineup by eliminating the Dodge Dart and Chrysler 200 passenger cars while investing in the profitable Jeep SUV line to eliminate net debt by the end of his plan in 2018. After that, Marchionne has said he intends to retire. The compensation figures were reported in euros in an annual filing and converted to dollars at the average 2016 rate of about $1.11. This year, Marchionne is due to receive a bonus of about $6.5 million based on the company’s 2016 performance, according to the filing. For 2015, General Motors paid CEO Mary Barra $28.6 million and Ford Motor Co. paid CEO Mark Fields $18.6 million. The companies have yet to report compensation for their top executives for 2016.